Martha Kane, PhD, brings a wealth of expertise and compassion for patients with substance use disorders to her work with community health centers. With help from Mass General, the GE Foundation and the Massachusetts League of Community Health Centers are collaborating to train and support clinicians who treat patients with substance use disorders. Treating patients with substance use disorders requires special skills. To build those skills among doctors and other clinicians, the GE Foundation is partnering with the Massachusetts League of Community Health Centers (MLCHC) and drawing on the deep expertise in addiction medicine at Massachusetts General Hospital to support ten community health centers. The program, called Substance Use Support and Technical Assistance in Communities (SUSTAIN), is already working with leadership and clinicians at the ten nonprofit community health centers chosen for their demonstrated commitment to treating patients with opioid addiction. The Massachusetts League of Community Health Centers, a Boston-based nonprofit organization is running the program with support from the GE Foundation, the philanthropic organization of GE. Mass General and the Boston Medical Center are providing training and expertise. Psychologist Martha Kane, PhD, clinical director of Mass General Substance Use Disorder (SUD) Initiative, is sharing her considerable expertise in addiction medicine with clinicians at the community health centers as part of the program. Relying, in part, on the model developed at Mass General, the SUSTAIN program includes leadership coaching, peer-to-peer coaching, training in prescribing for addictions, multidisciplinary clinical case discussions and champions teams comprised of representatives from all disciplines in the health centers. “It’s exciting that something we’ve been working on at Mass General has been picked up and has morphed into this larger approach in the community,” says Dr. Kane. 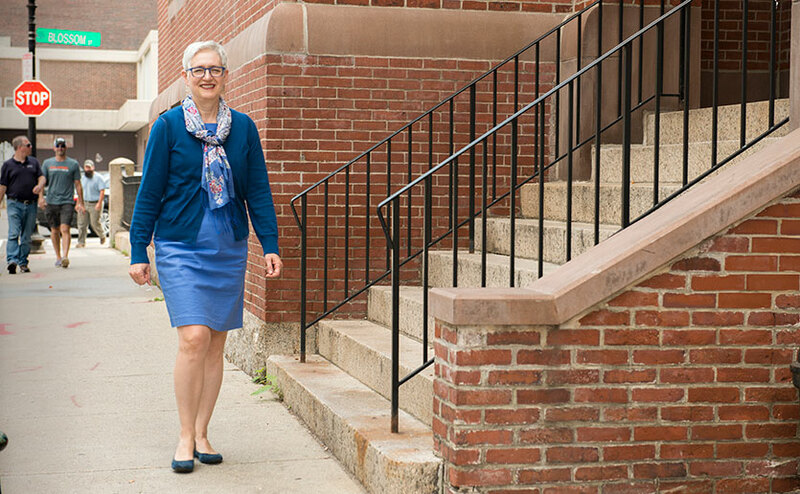 She helped to build Mass General’s SUD Initiative from the ground up and is now bringing that knowledge and experience into the community through clinical risk rounds at the health centers. The challenge is enormous. Opioid drug overdoses kill six people in Massachusetts every day. Treating patients with substance use disorders is complicated, Dr. Kane says. With her thoughtful demeanor and immense energy, she is working with doctors and other clinicians in the community health centers to address those challenges. Patients with addictions often miss medical appointments, show up late or neglect to follow their treatment plans, she explains. If they do show up, their mental health issues can cause stress and disruption. For example, they may be experiencing drug withdrawal but are afraid to reveal it as the reason they feel sick, irritable or angry. The clinical risk rounds, initiated by Dr. Kane, bring clinicians together to discuss and manage individual cases. Each week, doctors, nurses and others meet at the community health centers to describe their patients with substance use disorders and brainstorm about treatment plans. Dr. Kane consults with the group either in person or by video conference. New “champion” teams are also at work at each of the community health centers. The teams help coordinate and streamline logistics so that a team of providers can work together in a coordinated way. Those providers include doctors, nurses, social workers, behavioral health clinicians and even the front desk staff and security guards. “If a patient becomes disruptive in a waiting room, the person at the front desk sees it first and the security guards are sometimes brought in,” Dr. Kane explains. Another important component of SUSTAIN is leadership coaching, which the GE Foundation is providing. The goal is to encourage the leadership at each community health center to support the SUSTAIN program and help ensure success. Peer-to-peer coaching, is also formalized in the SUSTAIN program. In this case, that means doctors who are trained and experienced in prescribing medicines to treat opioid addiction work with others who may have less experience. Ultimately, the goal of this multi-pronged effort is to meet the patient on his or her own terms in the recovery process. Relapse is common, Dr. Kane says. Instead of turning such patients away until they get clean again, she keeps them engaged in the recovery process, increasing the likelihood of success. SUSTAIN is a one-year program. Going forward, a new group of ten community health centers will be chosen for 2018.